Israeli Nobel Prize for chemistry laureate Professor Ada Yonath has expressed her views on how Israel can reduce palestinian terrorism. Israeli Nobel Prize for chemistry laureate Professor Ada Yonath on Saturday said all Hamas prisoners held in Israel should be released in order to bring Gilad Shalit home. “I don’t understand why we incarcerate them in Israel in the first place,” the professor told Army Radio Saturday. Yonath was interviewed on the weekly Saturday radio show about her thoughts in general regarding the Middle East conflict and called for a “change in the status quo.” She said that holding Palestinians captive encourages and perpetuates their motivation to harm Israel and its citizens. “If we hold Palestinian prisoners captive for years on end, their familys’ resentment for Israel will grow and we are actively creating terrorists,” the Nobel Laureate suggested. Either this woman has spent way too much in the laboratory, isolated from real life, or she is gunning for a Nobel Peace Prize. He has also tried to explain why he agreed to have the Goldstone Report passed on to the next UN Security Council session in six months. The president, who has been under serious scrutiny from Hamas and many other bodies in the Arab world, tried to explain Palestinian “folding” that some called a “betrayal of martyrs’ blood”. I’m guessing that he agreed to have the Goldstone Report passed on to the next UN Security Council session in six months since he and his Fatah party pushed for Israel to go ahead with Operation Cast Lead and deal a huge blow to Hamas, which is something Israel had threatened to expose unless he withdraw his support for an adoption of the report. If I’m right, the PA may just have bitten of its nose to spite its face. 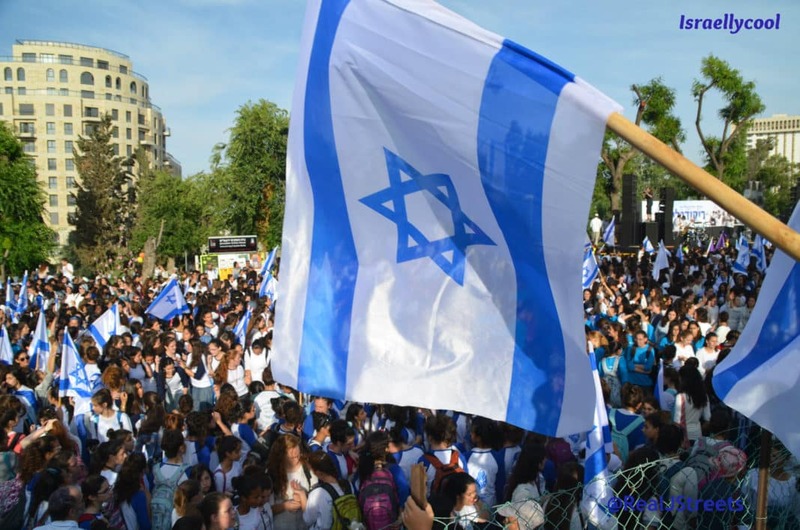 Unless the US has asked Israel to refrain from weakening the PA by revealing the facts. 8:28PM: This next story is likely to put you off bananas for good. 7:52PM: This next bit of Israeli ingenuity may not win a Nobel Prize, but I’m lovin’ it. British film director Ken Loach may oppose promoting Israeli movies at international festivals, but his films are actually going to do just that: Nurit Shani, CEO of Lev Cinemas and Films, announced on Wednesday that the profits from the local distribution of Loach’s new film “Looking for Eric” will be dedicated to the distribution of Israeli films both in Israel and abroad. “In recent years, Ken Loach has voiced a number of criticisms against Israel and its policies,” Shani said before the premiere screening of the film at the Haifa International Film Festival. “I believe it is any artist’s right to express his opinion, and I have therefore always given his films a screen. Unfortunately, in the past year I discovered that Ken Loach himself does not share my views. The original artist, who I considered a great humanist, has turned out to be a man who does not believe in freedom of expression for people whose opinions oppose his own. In the past year, Loach led that protest against the Edinburgh International Film Festival, whose organizers chose to screen the Israeli film “Surrogate” with financial support from the Israeli embassy. Loach later took part in a protest against the “City to City” program at the Toronto International Film Festival focusing on films about Tel Aviv. Shani said she has been bringing Loach’s films to Israel for almost 20 years, but could not hide her disgust with his latest actions. “I view his deeds as an act of hypocrisy, a burning slap in the face of democracy and the humanistic spirit of his films. His movies are of a great director, but his actions are of a small person,” she said. As a result, Shani decided to donate the profit from “Looking for Eric”, and from his next film, to the distribution of Israeli films abroad. “I believe the way to fight the silencing – and there is no other way to define Loach’s actions other then attempts to silence – is to ensure that the Israeli voice, the Israeli creativity that is so diverse and fascinating, be heard load and clear, in Israel and in the world,” she said. I think this calls for unleashing the Nelson. 4:24PM: Israeli Deputy Foreign Minister Danny Ayalon’s briefing to the Foreign Press on the Goldstone Report. Leaving aside the issue of whether or not we actually took over land belonging to palestinians, how can anyone with an ounce of morality ask that question? 3:38PM: Turkey has announced the cancellation of an international air force drill, which was to include Israeli, as well as US, Italian and NATO forces, because the planes that Israel was going to send likely bombed Hamas targets during Operation Cast Lead. But not to worry! Turkish Prime Minister Recep Tayyip Erdogan thinks we are great at making money. And some of his best friends are Jewish..
9:55AM: Interesting video on the plight of Muslim Sudanese refugees who have fled to Israel from the genocide of Darfur. 6:22AM: Holy technical error, Batman! The Guardian was forced to amend an article on past Nobel Peace Prize winners on its Web site on Friday after it omitted the names of Israel’s prize winners. Following the announcement of US President Barack Obama’s winning the 2009 prize, an article written by the newspaper’s news editor Simon Rogers listed the names of all Nobel Peace prize winners since the awards inception in 1909. However, all of Israel’s prize winners – Menachem Begin, Yizhak Rabin and Shimon Peres – were omitted. In the 1978 entry, Menachem Begin’s name was missing, with only Egyptian president Anwar Sadat listed. 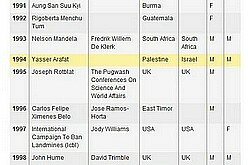 The same error occurred in the 1994 entry with Yasser Arafat the only entry and Yitzhak Rabin and Shimon Peres missing. In a statement on Friday, the newspaper blamed the mistake on a “technical issue,” saying the names was accidentally omitted. Although the Israeli winners are never mentioned first on the Nobel Peace Prize list, I find it hard to believe that this is a mere technical error, especially given the Guardian’s reputation for being anti-Israel. Besides, these “technical errors” always seem to be to the detriment of Israel.